I am a TED virgin, the definition of a person who has never attended the Big TED conference before. I am also a TED introvert. Dr. Brian Little, a personality psychologist, gave a TED talk Tuesday explaining that introverts step out of their boxes only for important projects. Know what an introvert’s project is and you know their motivation. Having the opportunity for collaborative brainstorming with smart people about the organ donor shortage is definitely a reason to stretch. But, after just a couple of days, I feel frayed at the edges. Dr. Little also noted that, after stretching, introverts must be given time to recharge quietly. 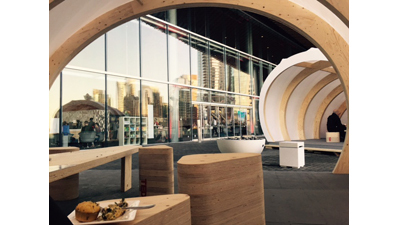 So, I eat breakfast outside in a wooden pod with a sail called Elevate built by local students. My favorite place to have breaks inside is in the Target park, decorated with fake grass, a tree, and pillows where you can lay down. They give you a creative journal there and a blanket. The biggest fear of people who Dream Big, says Dan Pallotta, charity defender, is that they will be denied the opportunity to fulfill the full potential of their dream. As the TED talks unfold, many share stories about the years of work and failures that have arisen before a breakthrough occurs. The AirBnB founder, Joe Gebbia, talked about making early, ridiculous pitches to venture capitalists he hoped would fund his Big Idea of people sharing their most private spaces with perfect strangers. Cedric Villani spoke about going to bed one night, despondent after being unable to solve an important mathematical problem, only to awake with the answer that had been eluding him, which led to him winning the Field’s Medal in 2010. Because Google X supports both boundless optimism and skepticism equally, Astro Teller shared stories of the Ideas that were eventually killed as well as those that are still going. At the moment a project was killed, the research team was given high fives and bonuses. Adam Grant says that true Originals feel as much vulnerability that their idea is flawed as anyone else. They just don’t take on the idea that they are thus flawed as a person. This allows them to keep going. Later, at TED Dream, I find a haven for introverts in the Workspring area. They are creating a work spa space for us, with rooms where you can sleep and work alone on your computer. They have desks inside little screened pods. In this area, I watch Norman Lear being interviewed, as I sit under a fur blanket. The simulcast screens are at half volume. There are two other people here with me. We smile at one another but don’t speak. Norman Lear minimizes his lifetime of contributions, justifying this by saying that if you think about the universe as a whole, his impact is just a blip. The paleontologist speaker after him shows pictures of bones that he discovered of the largest dinosaur ever found. “Whoa,” I say, out loud, and the other two people nod. I didn’t go to the Bollywood party the other night. I turned in early after applying the aromatherapy provided to attendees. Being a Dreamer is hard. It is unclear whether boundless optimism or realistic skepticism will prevail as to whether we can solve the kidney donor shortage. Perhaps the answer will come to me in the night.